How loud is a diesel goods train? These trains aren't electrically operated, like passenger trains. They have huge diesel motors that are powerful enough to pull the many (many) heavily-laden goods coaches. Now, with (what seems like) hundreds of heavy coaches in tow you can imagine that there's no way that the driver could ever hope to stop the train in the event of an emergency. So, what do they do to compensate for this, to make things a little safer? They put a HUGE horn on the front of the train. I swear if you were to listen carefully, and if there were air in outer space, you'd hear this horn on the moon. Anyway, one warm summer's day I was returning from a long day of lectures. I had the sliding window all the way down (yes, they could do that in the '90s) and was drifting in and out of sleep while the wind from the open window cooled me down just enough to make the dozing comfortable. You see it coming, don't you? Well, I didn't. While I was dozing and in a state of absolute relaxation one of these diesel trains was closing in on my train at a speed that was too fast for me to hear its large diesel engines in time. The first time that I realised it was there was when it was only 15 metres from my window, diesel engines roaring and blowing its moon-horn for all it was worth. Posted in General on Wednesday, 18 August, 2010 by Paul. Hey Paul. I live near a railway line. Normally, it doesn’t bother us at all. However, on weekends and in the early mornings you can hear the goods trains shunting backwards and forwards. We’re used to it now, and usually go straight back to sleep, or don’t even wake up properly. When we first moved in though, it used to wake us every morning and we’d struggle to sleep. In many respects, it reminds me of living in London, where you were always within hearing distance of a railway line and the sound of the trains and their horns was a normal backdrop to everyday conversation and life. Fortunately for us, Nixgrim, we don’t currently live within hearing distance. We’re on the dark side of the moon. ;) But, in our previous house we’d hear it at night when the wind blew in a particular direction. In some respects our current quiet neighbourhood is a bad thing though. When we sleep out elsewhere we’re very sensitive to noise. I can’t imagine how difficult it must be for people living on remote farms who visit the city on vacation. We live on a main road with constant traffic going by although it lessens off a lot over night. I must admit when we first moved here from the countryside I really didn’t think I’d last the first week but some 32 years on we don’t really notice the traffic as much now but it’s still there in the background. Reading your story did remind me of my days travelling into town every day to go to school, the morning travel wasn’t that great but I loved sitting in the train and relaxing on my way home in the afternoon. Bev – yeah, I recall you mentioning this. I know what you mean by too quiet… or at least I use to know. Our neighbourhood is pretty darn quiet – so much so that I never noticed the quietness of Kruger Park when we visited earlier in the year. The shunting near the railyards are noisy ye. Lol, you’re a funny man Marlon – yea, I prolly would have. I never mentioned shunting though – does it bother you? I can’t say I’ve ever noticed it being a particularly noisy process. 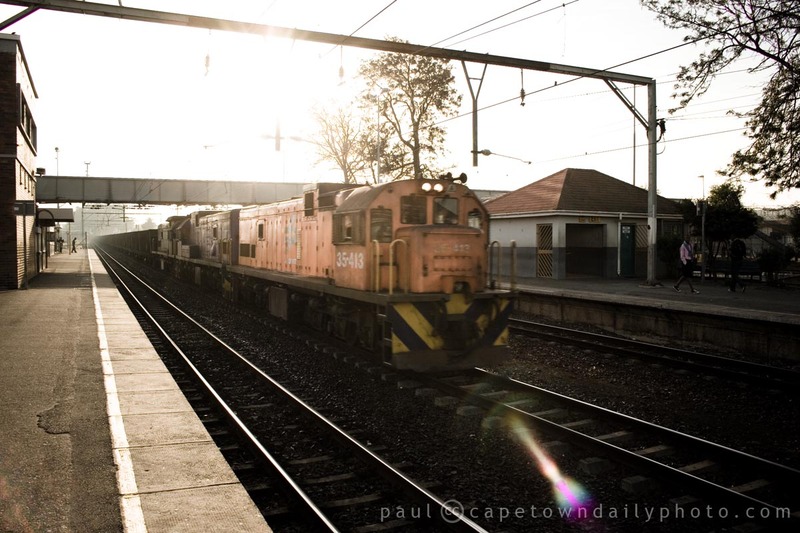 Do you live close to railway lines? I guess it could be noisy at night. Thunderstorms? TBH, I kinda enjoy thunder – the deep rumbling – awesome stuff. That said, I’m not sure why you’re correlating the diesel train’s hooter with thunder – one can’t really hear thunder on the dark side of the moon. Also, I’m not sure what you mean by the music thing… that’s kinda weird. I get playing music loud (this I may do from time to time), but with the aim of annoying neighbours? Do people do that?